Sometimes you have to lean in close to hear what Katie Haverly has to say. But back up when she starts to sing. Girlfriend's got some lung power. 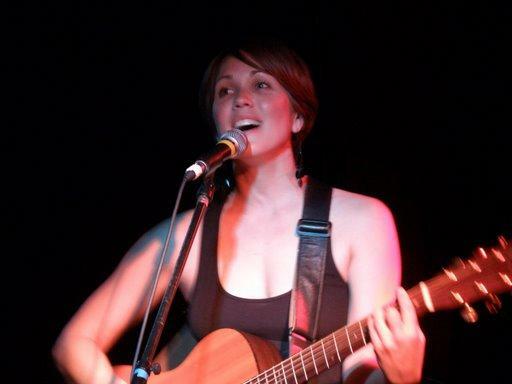 The soft spoken singer/songwriter has lived in Phoenix, Flagstaff, Chicago, Boulder, Chapel Hill and England but she considers the Capital Region her home. She's living in Troy these days and when she's not making music she's a public health researcher for NY State. Haverly sat down over a cup of tea and answered a few questions for AOA. Your speaking voice is so soft, but when you sing, you blow the roof off the place. What is that about? I think it's because when you're performing, it's different than having an intimate conversation. I don't feel like I'm quiet. Singing is a very cathartic experience. It's the same with improv. I do improvisational comedy with Mop and Bucket . You just get out all your guts out. You've lived so many different places, why do you keep coming back to the Capital Region? A lot of reasons -- friends, family. I was born here, but we moved to Phoenix when I was two. My parents live here now. When I was a kid in Phoenix I'd visit here every summer and I'd be like, Llook, there's a blade of grass, there's a brook, there's a tree," because I lived in the desert. I love the seasons here. I've never felt as much myself as I do here. I'm comfortable. I can thrive. The quality of life is better here than anyplace else I've been. When I lived in Chicago there was so much competition for jobs. It's easy to find work here. I produce and fund all my own records so I need a good job. And music isn't everything. If I can have a job that's meaningful, where I can help people, that's important. Also, there's a cutting edge creative community here. There's so much good music here. After having traveled so much, what do you think the Capital Region is missing? I wish we had more appropriate good mid-range music venues. I used to love playing at The Larkin, but that's gone. I love playing Red Square. But I don't like playing in bars so much and I don't have a wide enough fan base for the larger venues. We need more intimate venues for people to play. I'm not sure why we don't have many since there is so much great music here. What do you miss about the Capital Region when you travel or live other places? I miss Spiaks and the Purple Pub, those sort of New York Italian restaurants with good food at good prices that I haven't found anywhere else. I miss the familiarity. There's always been a real network of musicians here supporting each other here. I feel like that community is in a state of flux right now, but it's still strong. Bands are breaking up and new ones are being formed. Older musicians are having families. Still there's that vital creative force in this area. Does the place where you are living affect the kind of songs you're writing? Sure, where you are is very important. When I was in Chicago the songs I wrote were different than anything I'd ever written. They were more jazzy and more complicated. In North Carolina it's warm and slow, and my songs had a long slow feel to them. Then your life events affect your music. I could say the type of songs I wrote was an effect of the environment, but age and life circumstances probably had a lot to do with it, too. I find I write more when I'm away from home. There's more time to reflect I guess. I started writing music for the first time when I went to school in England. I think it was the self discovery. Do audiences vary from city to city? I don't think so. I would have to say no. I think the people who like my music are so varied. Wherever I go the audiences are made up of the kind of people that like that music. It's fascinating to have anyone like what you do . How would you describe the culture of the Capital Region? Because there are so many universities in this area I think there is a young energy here. But this young energy is juxtaposed with a history. There are people who have lived here for generations. There's also a more blue collar culture. A lot of people can afford to live here. It's not an elitist area as far as access to culture and inspiration. Some other cities it's hard to penetrate the core of the city . I feel there are ways to connect to culture here. If you can't afford to go to a concert you can walk down to the park and see one for free. You can hear Katie along with Matt Durfee and Alta Mira on Saturday night at 8 at Red Square.